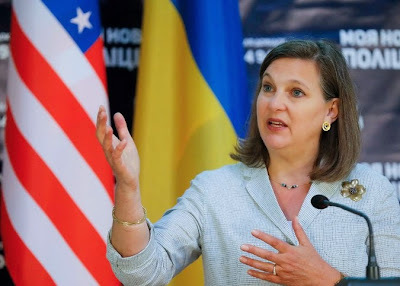 MOSCOW, Russia -- The United States will deepen its involvement in negotiating a solution to the Ukraine crisis, with a senior State Department official, Victoria J. Nuland, to hold a day of talks on Monday with Russian officials on buttressing a rickety peace agreement. Victoria J. Nuland, a senior State Department official, in Kiev, Ukraine, on Saturday. She will be in Moscow for talks Monday. Until now, the peace agreement reached in February by the leaders of Russia, Ukraine, Germany and France has curbed the worst violence between the government forces and the Russian-supported separatists in southeastern Ukraine. Fighting continues at various flash points, however, and work on carrying out political and economic measures in the agreement, negotiated in Minsk, Belarus, has sputtered. “There is less firing, but none of us should be satisfied with the results,” Ms. Nuland said Saturday at a news conference in Kiev, Ukraine. Ukrainian soldiers were drilled by American military trainers in Yavoriv, in the country’s west. She arrived in Moscow for negotiations just days after Secretary of State John Kerry met for four hours with President Vladimir V. Putin in the southern resort of Sochi to discuss Ukraine, the Iranian nuclear negotiations and the Syrian conflict, among other issues. It was the first visit by a senior American official since the Ukraine crisis erupted in February 2014. Russia, Germany and France previously made it clear that they did not necessarily welcome the Americans at the negotiating table as part of the “Normandy format,” the group of their leaders, as well as President Petro O. Poroshenko of Ukraine, who hammered out the Minsk cease-fire. So it was unclear how the European Union might react to greater American involvement, despite repeated statements from Washington that it was coordinating its position with Berlin and the rest of Europe. Ms. Nuland, the assistant secretary of state for European and Eurasian affairs, is expected to meet primarily with Grigory B. Karasin, a deputy foreign minister. Germany and France have managed to hold together European Union support for economic sanctions against Russia — which must be approved by all 28 member states if they are to be extended at the end of June — in large part by arguing that the peace process was a European effort. Greece, Hungary and Cyprus have shown signs of wavering. On the other hand, the Europeans are still clinging to the Minsk accords as the best means to prevent Russia from turning the war in Ukraine into an unresolved, frozen conflict. The United States, which has repeatedly accused Russia of arming and training the separatists, is evidently impatient to test Moscow’s commitment to the peace plan. “In Sochi, President Putin told Secretary Kerry that he is fully committed to Minsk implementation,” Ms. Nuland said. The Minsk accords called for the formation of working groups on a number of crucial issues, including humanitarian aid for the separatist region of Donbas, as well as the economy and plans for the future political process there. The groups were organized this month and are expected to begin talks in earnest this week. Ms. Nuland said she would concentrate on certain specific goals for those groups. American officials have emphasized the need for a cease-fire around the southern coastal town of Shyrokyne. The ridgeline above the western edge of the nearly abandoned town remains under the control of Ukrainian forces; if captured by the separatists, it could facilitate an attack on the neighboring, strategic port of Mariupol. Besides Shyrokyne, there are about a half-dozen points along the confrontation line where fighting continues intermittently. Three Ukrainian soldiers were killed and 17 wounded in the past 24 hours, according to a military spokesman in Kiev; more than 6,200 people have been killed in eastern Ukraine in just over a year. The separatists repeatedly accuse the Ukrainians of firing on their positions, as well. Humanitarian aid is another issue, with convoys freely entering the separatist regions of Donetsk and Luhansk from Russia but not from Ukraine. The United States wants to open corridors for aid from Ukraine and also to subject the Russian convoys to international inspection, with access for inspectors from the Organization for Security and Cooperation in Europe all along the border. The political process is expected to be especially difficult to negotiate, not least the organization of free, fair elections in an area from which so much of the population has fled and where armed separatists are in control. The United States and Europe have hinged the rollback of economic sanctions against Russia, except those linked to the annexation of Crimea, on the complete implementation of the Minsk accords. Those accords, under the supervision of the Organization for Security and Cooperation in Europe, were supposed to breathe life into an initial cease-fire agreement, negotiated in September. Yet Putin considers Ukraine of strategic importance to Russia, a part of the former Soviet Union that should not join Europe, and it is not clear that sanctions have hurt the Russian economy sufficiently to spur him to change his policy there. Many independent Russian analysts think that Putin is just biding his time, keeping the fighting on a slow burn until economic problems in the European Union itself force a return to business as usual with Russia. Russian commentators who support the Kremlin certainly took that attitude after Mr. Kerry’s visit, suggesting that Moscow and Washington could figure out the future of the embattled country themselves. “In this situation — and this is confirmed by Kerry’s visit to Russia — the possibility cannot be ruled out that Americans are starting to behave more realistically than was the case a year ago, when they were essentially trying to do battle with Moscow,” Sergey Karagonov, an occasional Kremlin adviser on foreign policy, wrote last week in Rossiyskaya Gazeta, a government newspaper. Those Russian soldiers must be prosecuted by military court. This case must be public and televised on Ukrainian National Television if such exist and would be good to invite American and European observers and press.